Jerri here to share a patriotic card with you! I really wanted to do something for the upcoming holiday so here it is. I'll apologize right up front because I wanted to do a step-by-step tutorial on this but I've had a crazy week and I just couldn't get it pulled off in time. So without pictures I"ll do my best to give you the step-by-step instructions. It looks long but that is because I'm a little windy and not because the process is complicated ha ha. (no really I'm a talker hee hee). This is a super easy card that can easily be modified to fit whatever supplies you have on hand. Cut a piece of Kraft cardstock to the dimensions of your card. I cut a piece of 8 1/2 x 11 cardstock in half to make a card that has dimensions of 4 1/4 x 5 1/2 when folded. I placed a star stencil by Heidi Swapp over the right edge of the card, then I sprayed over the stencil and card front using Glimmer Mist in the color Denim. You could use any spray you have in red or blue, and you could use any stencil that would work with the theme. There are several cool stencils available at the TJ Website. I found this cute red, white and blue ribbon at Wal-Mart. I really wanted to hang a charm from the ribbon but since resources are pretty slim in my neck of the woods, I was unable to find what I wanted. I dug through my paper stash and found some patriotic paper. I cut out the USA and then I used my Martha Stewart Ribbon Threader Punch to punch two holes so I could thread the ribbon through. If you don't have a punch like this, you can cut slits with a craft knife where you want to thread the ribbon. I've done that many times and it works really well. Once the ribbon was threaded through the tag, I wrapped it around my card. The section where the ribbon comes together should meet in the front so it can be hidden by the flag. Cut a piece of white cardstock to the size you want your flag to be. This will be the base for your flag. Tear strips of red and white paper to fit horizontally on the cardstock. Make sure the edges that will show along the top and right side of the flag are left with a straight edge..
Once all of the red and white cardstock pieces are torn to size, make sure they fit on the piece of cardstock that you cut in in step 4, as your flag base. Glue your red and white stripes along the right edge of the flag base and layer them if desired. I layered by starting at the bottom and working my way up the flag (like shingles). 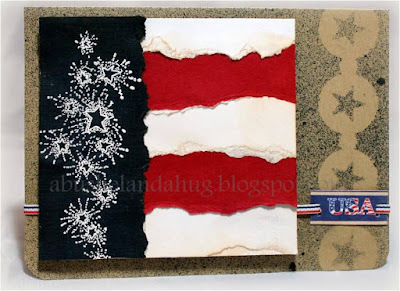 I used some Tim Holtz ink in Tea Dye along the edges of the red and white strips to give it an aged or an Americana look. Glue the blue paper with the stars along the left edge of the flag. Now that the flag is assembled, cut a foam sheet just smaller than the size of your flag and glue it to the flag base before adhering it to the card. This will raise the flag slightly above the card to give it dimension. You could use pop dots here but I really like using the thin foam sheets for larger areas like this. You can refer to a post on my blog on June 1st regarding these sheets and how I use them- Technique Junkies Blog Hop- Happy June. I learned about using the foam sheets from the talented Jennifer McGuire Blog. I hope you enjoyed today's card post. If you have any questions or comments please let me know. I would love to hear from you.